N-Vision BNVDP-HM, BNVDGP-HM BNVD Night Vision Binocular (Generation 3 Pinnacle) FREE SHIPPING! 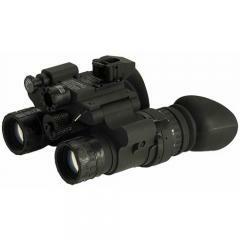 have many night vision optics to choose from. The BNVD Night Vision Binocular from N-Vision is tough, dependable low-light optic optimized for military and tactical applications. It utilizes the latest in third generation night vision technology and premium quality lenses to deliver superior contrast and clarity when little light is available. Two light intensifier tubes utilize every available ray of light to deliver enhanced depth perception for a more accurate sight picture at further distances. A wide field of view and virtually unlimited field of focus male the BNVD ideal for surveillance operations of all kinds. A tough exoskeleton allows the binocular to take heavy levels of abuse and still retain total functionality. Drop, slam or even submerge the binocular up to 66 feet and it will still perform like it did they day it was removed from the box. For long range missions, optional 3x magnifier lenses can be attached. The BNVD comes with a head mount for convenient hands-free use. ©2002-2019 CopsPlus.com: N-Vision BNVDP-HM, BNVDGP-HM BNVD Night Vision Binocular (Generation 3 Pinnacle) FREE SHIPPING!